I took a cutting from my hydrangea. I left two sets of leaves and plucked off the rest. I then stuck the plant into a blend of soil and perlite with two nodes under the soil. It has sprouted a few new leaves so I decided to transplant it, but when I took it out of the soil, It seems that instead of roots sprouting from the nodes, there were leaf buds there. As far as I can tell, there doesn't seem to be any roots growing anywhere else. Should I leave it alone? Can it still work? Will it grow roots on its own? Should I chop the bud off? Edit: I did this about two weeks ago, taking a cutting from a mostly dormant branch near the ground. I used the Schultz Take Root Rooting Hormone and dabbed it on the sides of the cutting, including the bud. I have no idea what kind of hydrangea it is, but it is this one. From the link it seems to be French Hydrangea. Your branch buds were already determined to be vegetative and not roots. Cut just above your bud node at an angle sloping down so water will drip off between the buds not on the buds. Leave a 1/4 inch above the buds and get rid of all above that node. Then stick it back into the soil...really should use sterile potting soil, don't make it yourself. Keep your plant warm and cover pot and plant with saranwrap. Stick popsicle sticks to lift the plastic off your start. Before you make this little moisture house, moisten the soil, don't over wet. The pot should be no larger than 3" in diameter. "Rooting hormone has been shown to not be effective". I AM REMOVING THIS PART OF MY COMMENT. But I used to use the powder and it made me feel better. Do not put this plant in the sun or too close to a grow light or it will cook. Give it a few more weeks. Shoot using those plastic drink cups for 'cocktails' with punched holes at the bottom would allow you to SEE the roots forming or not. Most people cut at least 5 or 6, 1/4" diameter chunks, each with a node and buds. They don't all make it usually. Good luck! If you only did it a couple of weeks ago, that was a bit late for a hardwood cutting. 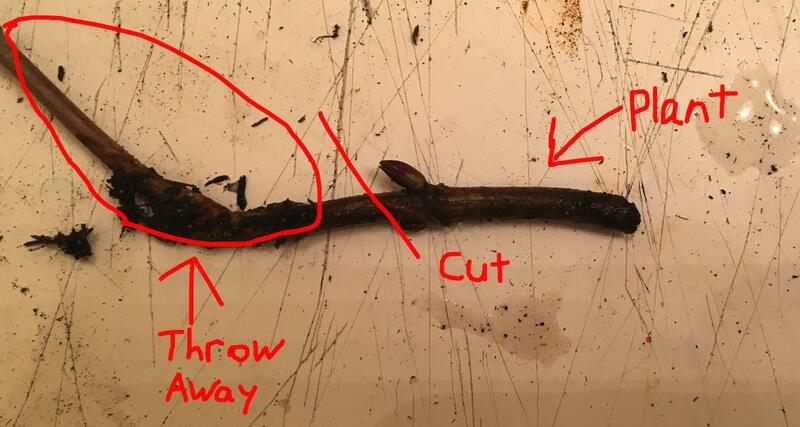 You can follow Stormy's instructions regarding this particular cutting to give it a second chance, but you can also propagate Hydrangea from soft or semi ripe cuttings as well as hardwood, see link here, under propagation, which has secondary embedded links regarding how to do each type of cutting https://www.rhs.org.uk/advice/profile?PID=122. You will note from the link that climbing hydrangeas are best propagated by layering, but all the others are fairly easy from any type of cutting, done at the right time of year. Maybe try a soft cutting when the new growth has got going, or a semi ripe one later on, as well as giving the one you've done another chance. Not the answer you're looking for? Browse other questions tagged propagation cuttings hydrangea or ask your own question. Are hormone rooting products effective? Can trees be propagated from cuttings without roots or leaves? What to do with fig cutting in water? Thornless Blackberries, can I root from cuttings? How can I propagate a rubber tree plant from a cutting? How much water does a Common Boobialla cutting need? What method should I use to have success propagating pothos?